This 5-year-old was referred by the paediatrician because of the following dysmorphic features which had been present since birth. Her growth and mental development were normal. She had no family history of similar condition. Her parents were keen for some corrective surgery as she was always mistaken for being mentally deficient and at the play school she was teased by other children for looking funny. Figure 1, 2a and 2b. 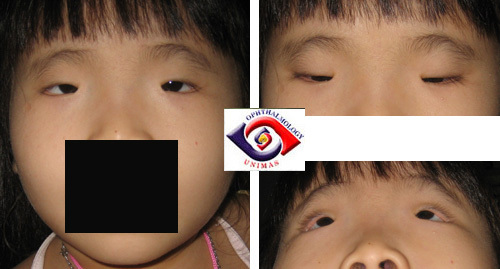 Frontal facial appearance of the patient and on attempting to look down and up. a. Based on the facial features above, what is the most likely diagnosis? b. Is this condition associated with any systemic abnormalities? c. How may one improve the appearance of this patient?